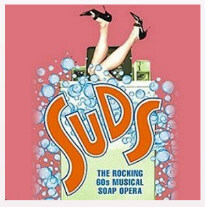 SUDS (Musical) ~ Cindy works in a Laundromat. It is her birthday and everything seems just swell until Mr. Postman arrives and gives her all sorts of bad news… after finding out she has been dumped by her pen-pal boyfriend for someone with better penmanship, she becomes depressed and tries ‘suicide by laundry.’ As she is being sucked into one of the washing machines, her friends, Marge and Dee-Dee, enter and think she is doing a new dance. At the end of the number, they realize she had been trying to kill herself and try to revive her. Cindy comes to and tells of her troubles and Dee-Dee offers some advice. “Mr. Right” enters, and Marge and Dee-Dee urge her to make a move. Mr. Right and Cindy have an exchange. He leaves a notice on the bulletin board… Cindy reads the notice he left, “Babysitter Wanted.” She is despondent. Dee-Dee comes up with ‘an idea to end all ideas!’ She decides to throw a magical birthday party for Cindy and to provide a fabulous ‘mystery date.’ The date turns out to be a disaster. Cindy is horrified. After the disastrous “party,” the women seem defeated. Cindy by this time feels her future is hopeless, and she says she does not even believe in love. Marge, Dee-Dee and a “mystery guest” try to convince her of the possibilities of love. Cindy, moved, seems to find a bit of renewed faith in love. She discovers a new confidence to put her troubles aside and move on. Marge and Dee-Dee realize their job is finished, and they, too, can move on. After Marge & Dee-Dee are gone, Mr. Right returns. It turns out he was looking for a babysitter for his dog… He asks Cindy if she would be interested. She remembers advice from Marge and Dee-Dee and decides to take control of the situation herself. She tells Mr. Right she will give him a call sometime, and she goes on to close up the Laundromat. Cindy decides it has not been such a bad birthday after all. Each season (Winter & Summer), save 13% by purchasing a 3-play season membership for only $52.